Also compatible with version 322-24182-00. Quality rubber replacement damper for a fuel tank on Yamaha motorcycles. It fits onto the frame of your motorcycle and stops excessive vibrations from damaging your fuel tank. Quality plastic replacement air filter cage for Yamaha motorcycles. COMPATIBLE MODELS 1975..
Quality rubber replacement damper for a fuel tank on Yamaha motorcycles. It fits into the fuel tank ..
Quality rubber replacement damper for a fuel tank on Yamaha motorcycles. It fits onto the frame of ..
Quality replacement engine mounting damper for Yamaha motorcycles. It insulates engine from the fram..
Quality rubber fuel tank strap for Yamaha motorcycles with steel plated rings.COMPATIBLE MODELS1970-.. 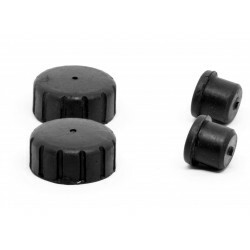 This kit contains two rubber front dampers (3TB-24181-00) and two rear dampers (122-24182-01).Front .. Replacement reed valve gasket from quality gasket paper for Yamaha motorcycles. COMPATIBLE MODE..
Quality replacement oil tank glass window for Yamaha motorcycles. COMPATIBLE MODELS1973-75 RD25..